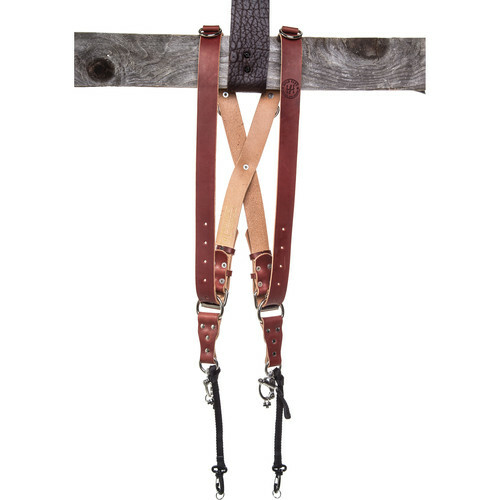 Hold two cameras comfortably at your hips with this small Money Maker Two-Camera Harness with Silver Hardware by HoldFast Gear made of chestnut English Bridle leather. For comfortable wear and shooting, the straps of the harness lie in an "X" pattern across your back for added support. The Speed Clutch mechanism allows the camera to slide along the harness to eye level easily. The small size is your best fit if you are 5'7 or shorter. The Money Maker Two-Camera Harness is made in the USA and backed by a lifetime warranty against manufacturer's defects. Designed to hold a camera on the left and right side of your body at hip level. Four metal D-rings permit you to attach accessories. Box Dimensions (LxWxH) 9.3 x 4.3 x 1.7"
Money Maker Two-Camera Harness with Silver Hardware (English Bridle, Chestnut, Small) is rated 4.7 out of 5 by 29. Rated 5 out of 5 by Joellim from Worth every penny! Wasn't sold on the hype and figured that it was a little over my budget. But after the first use at a wedding I shot, I realized this was worth every penny that I paid for it! The straps did not slip when I pick up my camera and it felt comfortable no matter how much movement I had. Add to all that, the form (and fashion) factor of the harness meant I didn't look like just another photographer ;) Only caveat would be to get the portrait sliders when picking this up as shooting in portrait orientation was a bit difficult with the original slider straps. Rated 5 out of 5 by ALM from Worth every cent I have a single camera harness that I got off Etsy for when I'm shooting with just one body; I assumed the quality of the Moneymaker would be about the same, which would have been totally acceptable. But this harness is beautiful. Leather is nice and thick and durable, hardware slides effortlessly up and down the strap; kept both bodies exactly where I needed them right at my hands. Portrait view is only slightly awkward compared to landscape, but getting less so as I get used to the strap. I'm a slender bird of a person and both cameras have somewhat heavy lenses on them -- carrying them in a bag is always a strain, but I've worked 12 hour days with both on the harness and the weight was so evenly distributed it wasn't a problem at all. Rated 4 out of 5 by Klarisse from The solution to post-festival body pain I'm a 5'1 woman photographer who has always had issues with camera straps that either 1) get in the way of mobile shooting, or 2) look too much for my small frame, or 3) are only comfortable for the first few hours of a 10-hour shooting day. I shoot a lot of festivals and night markets and more often than not my shoulders are always sore at the end of the night. I used the Money Maker just this weekend, from 8am to 11pm both Saturday AND Sunday and behold, no sore shoulders! No bruises! Only fatigue due to the long hours in which the Money Maker definitely helped ease shooting with two on-the-ready bodies at all times. My gear: 5D Mk3 with a UWA and a 70-200 on either side. I'm a short person, and the 70-200 never hit the ground or in any immediate danger when moving around. Some points minus 1 star: I check the screw on the tripod mount constantly and found that the screw loosens up very little, maybe twice in all the times I checked throughout the day so definitely make sure you screw it in tight. If you need to remove the body for overhead shots, quick screw-in takes some getting used to. ALSO, do not use with a camera backpack carrier since I did that for about an hour and it was painful (I was also sick at the time). Also because of my small frame, it can get heavy at times when you are just really tired. Hard to store unless you have a lot of space in your bag. Rated 5 out of 5 by Kyria from Love love love These straps are AMAZING. They take so much pressure off your shoulders and your camera doesn't swing forward like is does with the black rapid sling which drove me crazy!!! The one and only thing I don't like about this is the back up latch moves my shutter while using the other camera leaving my image over exposed if I don't happen to double check my exposure. This happens a lot as I'm shooting quickly. I suppose I could take off the back up as I can't imagine the camera coming loose with how powerful the clamp is. Rated 5 out of 5 by Grace from A lifesaver The money maker enables you to easily be able to carry 2 cameras on your body. Thankfull, I will no longer be slinging one camera over my shoulder while using the other one. I just shot a wedding while wearing the Money Maker for the first time and it made a huge difference in how my back felt at the end of the day. Definitely worth every penny. I ordered it on a Thursday afternoon and got it Friday in plenty of time for the Saturday wedding. B&H is #1!!! Rated 4 out of 5 by Heather Prescott Photography from I love this sooooo much! I've used it for 2 weddings so far, and what a difference! My arms are less tired from not having to compensate when one side slips - this thing doesn't move around at all! And my back and shoulders no longer hurt after gigs. It's a complete life saver. The hardware is a little squeaky, but that's the only con I can think of so far. I ordered the portrait slider, but so far I haven't needed it. Is there a way to order without D-rings? What is the difference in the sizes? Hello i want use nokin d600 camera with 70-200 lens and d600 with 24-70 lens is this belt going to hold 2 heavy camera at same time ? That is absolutely not a problem. I can easily shoot 12 hour weddings or events using this strap. On my right I carry a Canon 6D with a 24-105 f/4, and on my left I carry a second Canon 6D with a 70-200 f/2.8. Does it come with the portrait slider? No, it doesn't come with a portrait slider. It comes with two standard length sliders.